This brand-new recording on the Steinway & Sons label features Andrew Rangell, one of the truly distinguished Bach interpreters of the present day. The Steinway label is quickly establishing a reputation for perfectly capturing the sound of their instruments, the finest in the world, in these exceptional audiophile recordings. "I can hardly get enough of listening to this recording. It hypnotizes me. It takes me to a good and comforting place. Each successive listening reveals a seemingly, heretofore unnoticed beauty and profound polyphonic mystery. I realize how excessive this sounds, but this is how Andrew Rangell’s playing of J. S. Bach affects me...The miracle of this composition...is that it is an enormously moving poetic meditation, and it is this “Poetry” I feel, which Andrew Rangell evokes and reveals to us like no other previous interpreter. " Andrew Rangell seems to be just the sort of person you would like to talk to over a pot of tea and some delicious cakes. His multifaceted career has included recordings of many of Bach’s works as well as DVDs for children, which apparently call on “his special talents as author, illustrator, narrator, and pianist” (CD liner notes). 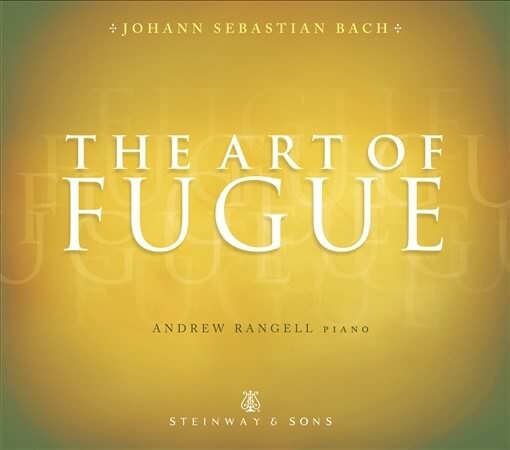 The notes on The Art of Fugue are written by the performer and provide a very accessible and comprehensive introduction to this daunting work. The playing has a similar effect to that of the CD booklet - Rangell manages to make the movements accessible through his playing. These contrapuntal masterpieces each have their own identity and the performer’s decisions about these identities and how to communicate to the audience is truly engaging. Contrapunctus 4 stands out; the particularly busy section, where the rhythms and voices start to become more entangled, is projected clearly as well as harbouring energy and drive. Movement 14, the first of four two-part canons, is somewhat magical. Until this point, the fugues have been building in complexity, both technically and in the devices used in their composition. Suddenly the texture is palpably different and this moment is often what distinguishes the great players from the good. Rangell handles this moment well, it is clear that he has an over-arching concept of the whole work whilst being able to focus on the details. The climax of the work, the unfinished triple fugue, stops the heart like nothing else can. The entry of the last subject which is based on Bach’s name (B flat A C B natural in the German notation system), is treated delicately by Rangell and how else to leave this work but in silence? The recording of this movement which is most arresting has Glenn Gould humming along with his playing. Whilst Gould will always be the man to beat on a piano for this work, this recording is more matter of fact and communicates more plainly than Gould, where one is often left thinking that Gould understands something that no-one else ever will. Rangell’s broad experience and scholarship lead to a cohesive yet detailed performance of one of the most inspiring pieces ever written.